With the launch of a new back-end tech service called Shop.ca Services, Canadian e-commerce leader Shop.ca says it hopes to make e-commerce solutions more accessible to small and medium-sized businesses by providing e-commerce solutions flexible enough to scale to meet the needs of each specific client. Shop.ca Marketplace Integration: Helps businesses who already have an online platform partner with Shop.ca to assist with cataloguing products and integrating into “Supplier World” to swiftly add products to the Shop.Ca Marketplace. eCommerce Implementation: For businesses who don’t have an online presence and want to learn how to establish an e-commerce channel to sell their products through a digital platform. Agile Merchant Partnership: A combination of above services but includes an online business strategy. Just last month, Shop.ca was front and centre at the IBM Connect conference in Orlando, where company president Trevor Newell discussed how IBM’s WebSphere Commerce solution helped the company scale quickly into an e-commerce leader. 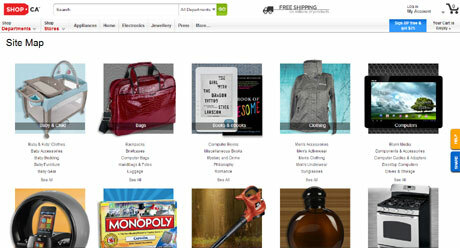 Shop.ca is currently selling more than 15 million different products.